Music business tips and advice including recording, copyright, trademark, music publishing and more. Tube microphones can really give you a unique sound. 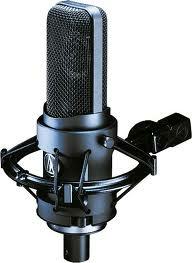 The recording will have a warmth that you just cannot get from a condenser microphone. The Audio-Technica AT 4060 has a large dynamic range and is extremely clear whether you are recording vocals or instruments. It comes with a shock-mount and power supply. I bought this microphone and I recorded two new songs with it that night. I loved the way my voice sounded on the track. The mic compares to any high end microphone I have used. I then had a buddy of mine come over and play acoustic guitar. It also came out to be a superb recording. Clear as a bell with no distortion. Tube mics really make a difference. Try it out for yourself. You will be pleased for sure. It sells for around $1350 at Guitar Center. Click the link below for exclusive deals. Online Only Price Drops at GuitarCenter.com! Comes with: Power supply, shockmount, cable for connecting mic to power supply, AC power cable, rackmount adapters for power supply, and protective carrying case with the AT4060 Tube Microphone. Artists and bands be sure to submit your music at these radio networks as well. Submit music on either site. Copyright 2017. Powered by Blogger. Should I Trademark my band or artist name? Is it even worth signing to a major label anymore? What does a music producer do?